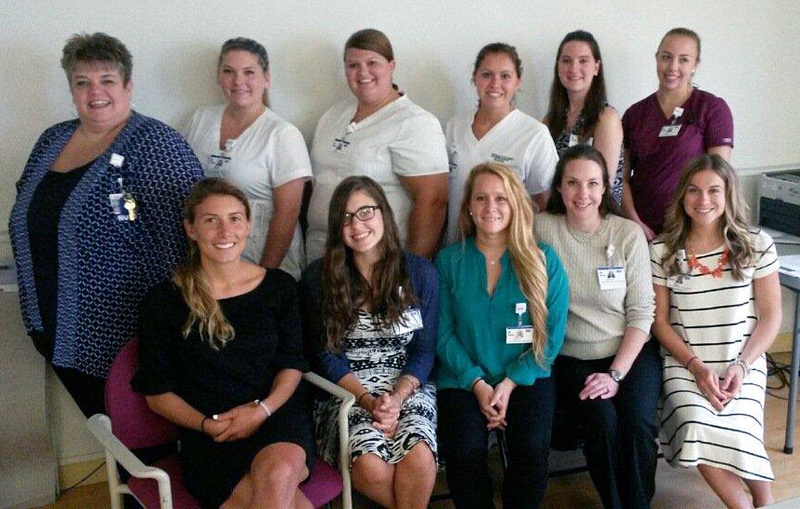 Ten nursing students started Beebe Healthcare’s 2015 Nurse Extern Program. These externs are currently enrolled in nursing programs and will work with Beebe Healthcare nurse mentors to enhance their education. This year’s students are from the Margaret H. Rollins School of Nursing at Beebe Healthcare, York College of Pennsylvania, Lynchburg College, University of Charleston, Penn State, and Georgetown University. The extern program is coordinated by Jennifer Hargreaves, RN, Manager of the Beebe Healthcare Education Institute, an internal organization dedication to promoting continuing education. The externs will work closely with their nurse mentors to gain hands-on knowledge of the hospital work experience. As a member of the healthcare team at Beebe, the externs can explore job opportunities and begin to develop their nursing career portfolio. Caption: Shown in back (left to right) are Jennifer Hargreaves, RN, Extern Coordinator; Megan VanSant, Margaret H. Rollins School of Nursing at Beebe Healthcare; Beth Willing, Margaret H. Rollins School of Nursing; Aubrey Bull, York College of Pennsylvania; Katie Daniels, Margaret H. Rollins School of Nursing; and Alyssa Luongo, Penn State. In front are Sophia Thomas, Georgetown University; Lindsay Hetrick, Margaret H. Rollins School of Nursing; Kayla Krause, Lynchburg College; Ashley Rego, Margaret H. Rollins School of Nursing; and Erica Lemmert, University of Charleston.